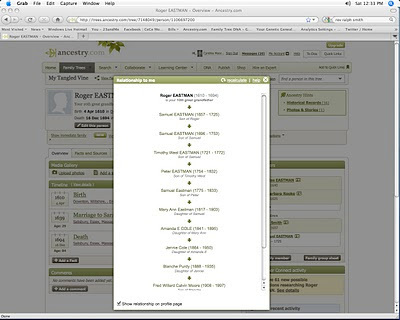 Have any of you noticed the new feature on Ancestry.com's Member Trees called "View Relationship To Me"? I just happened to come across it today while investigating a match from Jim McMillan's spreadsheet. The new match and I share the surname Eastman, so I was looking at the immigrant Roger Eastman on my Ancestry tree to determine our connection and I noticed a box on his profile page that said, "View Relationship To Me". 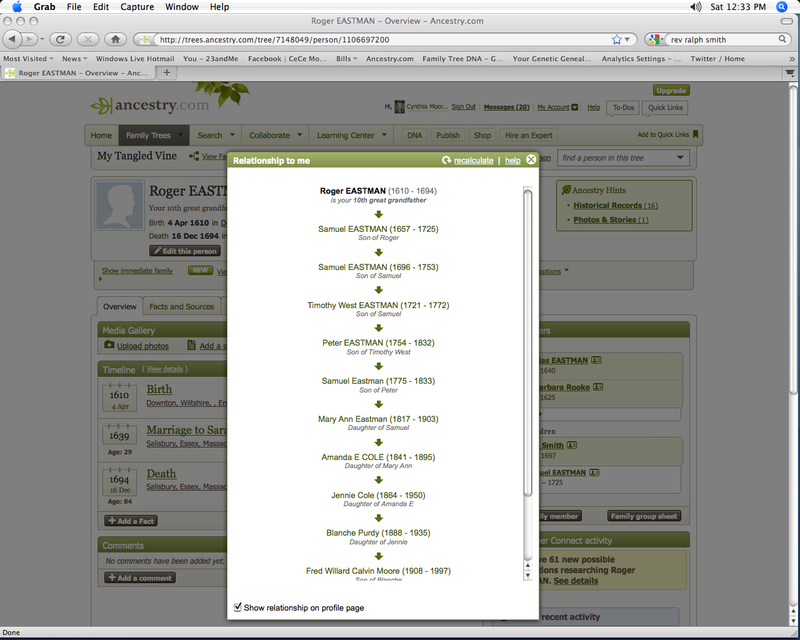 I clicked on it and it showed me the entire line from Roger down to me, telling me that Roger is my 10th great grandfather (and, it turns out, our connection)! I used to have to do this manually by counting down the generations. (Sometimes I would even get lost if I had listed the siblings in each generation.) Now, with one click I can see how anyone in my tree is related to me. This is a really great addition and definitely a time saver for those of us working on finding our connections to our DNA matches. There is also an option to add the relationship on your relative's profile just below their name, so anyone looking at your tree can see how you are related to a specific ancestor. If widely utilized, this may cut down on the "How are you related?" messages on Ancestry that so many of us receive (and send). There is a post about this new feature on the Ancestry Blog. Some readers have noted that they could do the same thing with their genealogy software, but I had never seen this before. Have you? I noticed this feature for the first time this weekend. It definitely is a time saver. Thanks for the additional info. I saw this a while ago as well and love it. Now I can tell all of my distant cousins how we relate. "relationship to me" is incorrect on all of my profiles.